Most of these collages are for sale in multiple forms. The original collages vary in price from $300 to $500. Scroll down to see larger images and descriptions of these collages. 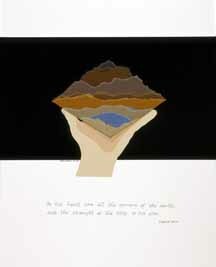 "In his hand are all the corners of the earth, and the strength of the hills is his also." This collage consists of torn and cut papers and measures 16"x20". I love the idea of the "corners" of the earth and tried to represent that in the landscape. "In the daytime he led them by a cloud, and at night by a pillar of fire." This 20"x16" collage uses a variety of papers, Lumiere paint and some dryer lint in the cloud. 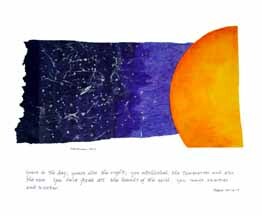 The two small collages of day and night are linked by the band of rice paper that physically connects them. "How sweet are your words to my taste; they are sweeter than honey." This 20"x16" collage is made of different cut papers. 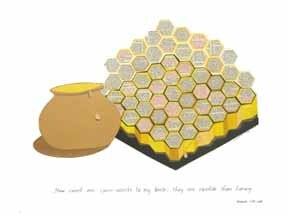 The individual cells of the honey comb are from a Bible. 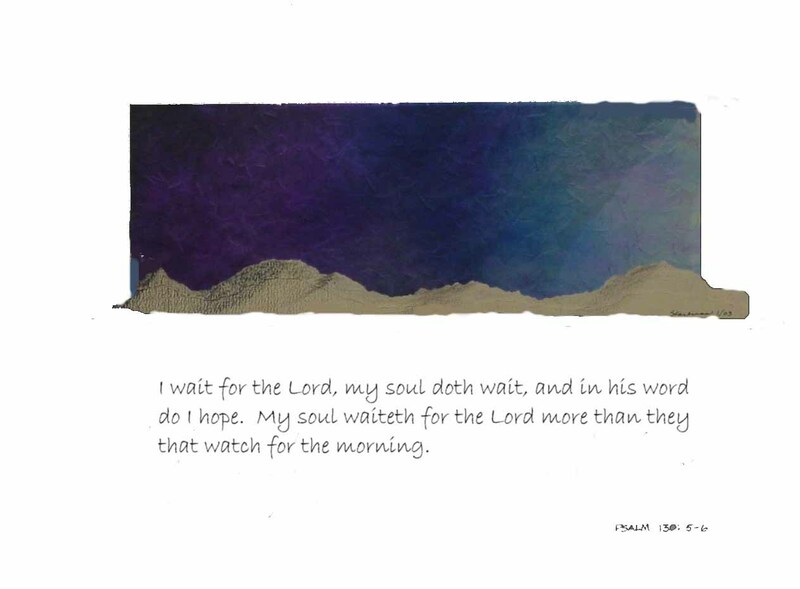 "I wait for the Lord, my soul doth wait, and in his word do I hope. My soul waiteth for the Lord more than they that watch for the morning." "For Thou wilt light my candle: the Lord will enlighten my darkness." This 16"x20" collage is composed of various rice papers with some Prismacolor drawing in the flame. The candle is negative space. "Lord, when doubts fill my mind, when my heart is in turmoil, quiet me and give me renewed hope and cheer." 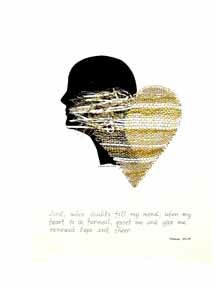 This 16"x20" collage has a heart woven into the substrate, with metallic threads and ribbon, showing both turmoil and peace and steadfast hope. "Open my eyes to see wonderful things in your word. I am but a pilgrim here on earth: how I need a map -- and your commands are my chart and guide." 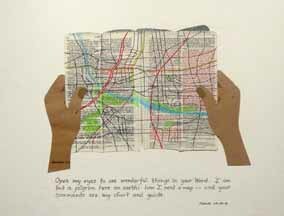 In this 20"x16" collage I have drawn a map on adjoining pages from a Bible, to symbolize using God's word as a "chart and guide." "Wake up my soul! 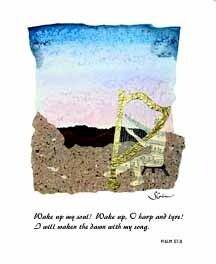 Wake up, O harp and lyre! I will waken the dawn with my song." "Your unfailing love, O Lord, is as vast as the heavens; your faithfulness reaches beyond the clouds. 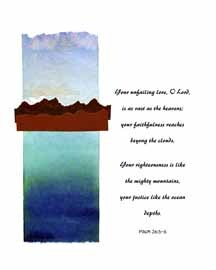 Your righteousness is like the mighty mountains, your justice like the ocean depths." "Yours is the day, yours also the night; you established the luminaries and also the sun. You have fixed all the bounds of the earth; you made summer and winter. This 20"x16" collage incorporates acrylic paint, various papers, and pen, to suggest the heat of the sun and the cold of winter. "May every fiber of my being unite in reverence to your name. With all my heart I will praise you. 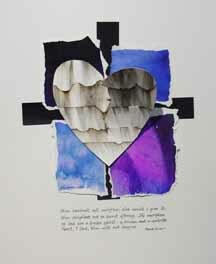 This 16"x20" collage features a heart woven from hand-dyed ribbon. 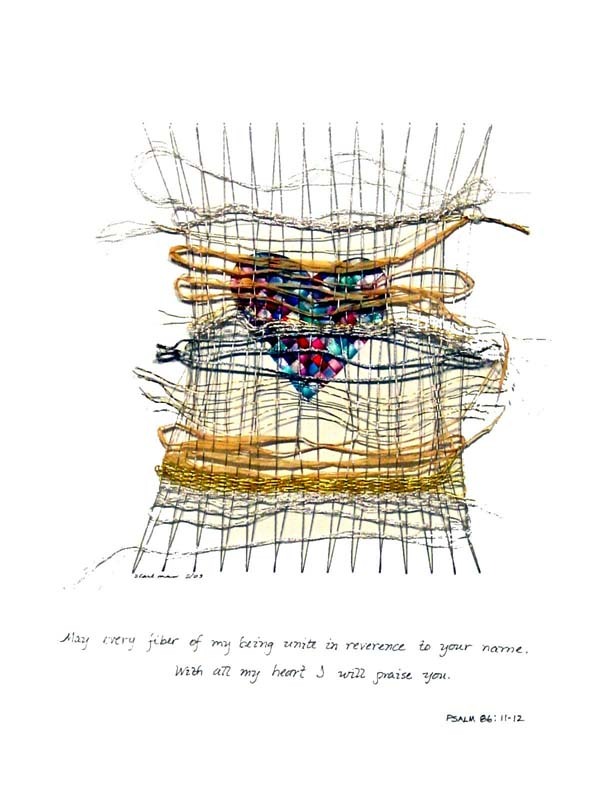 Over the heart is an open weaving of various wires and metallic threads to suggest marshaling all of one's disparate parts in praise to God. 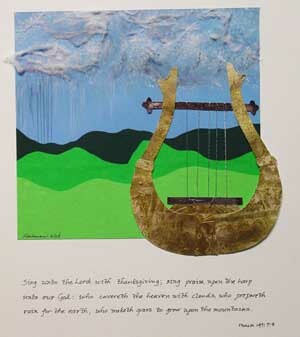 "Sing unto the Lord with thanksgiving; sing praise upon the harp unto our God: who covereth the heaven with clouds, who prepareth rain for the earth, who maketh grass to grow upon the mountains." This 16"x20" collage uses cut paper with string and cotton. The harp is cut from handpainted and textured gold paper. It is strung with metallic thread. Metallic strings also represent rain in the sky. 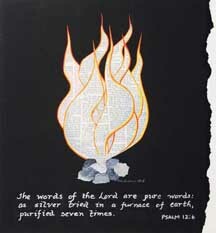 This collage features flames cut from Biblical text, embers of various silver papers and text hand-lettered in silver. 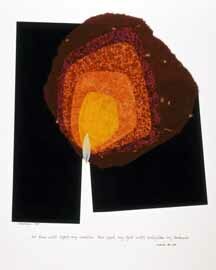 The camfered black background is on a white paper substrate measuring 16"x20". "Thou desirest not sacrifice; else would I give it: thou delightest not in burnt offering. The sacrifices of God are a broken spirit: a broken and a contrite heart, O God, thou wilt not despise." Overlapping the black background cross are pieces of watercolor paper. Above them is a heart composed of singed and charred paper. The heart is torn and three-dimensional. This collage is ready for display in its 17"x21" natural wood shadowbox frame. "You have seen . 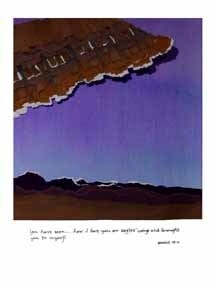 . . how I bore you on eagles' wings and brought you to myself." The background is painted on canvas paper. The wing is composed of tiny torn papers. It sits above the background and casts a shadow. The landscape is made from various torn papers. The collage is ready for display in its 17"x21" natural wood shadowbox frame. "We glide along the tides of time as swiftly as a racing river, and vanish as quickly as a dream." 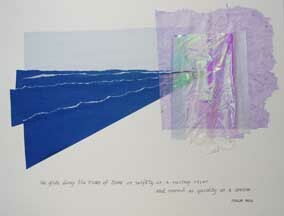 The 16"x20" collage uses several kinds of papers to suggest both the tides of a river and the insubstantiality of a dream. "O Lord, our Lord, how excellent is thy name in all the earth!" This 20"x16" collage is designed in a grid. 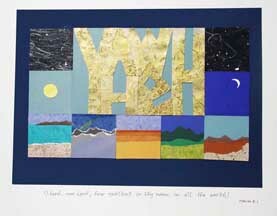 In the center the word "Yawheh" is spelled out in letters of hand-textured gold paper. On either side are squares that suggest the cosmos and the sun and moon. The bottom row is a set of mini-collages suggest the variety of landscapes found on our planet Earth. "O Lord, how manifold are thy works! In wisdom thou hast made them all: the earth is full of thy riches." I searched through years of National Geographic magazines to find small rectangles of plants, animals, people, skies, galaxies, and rocks to portray the richness of creation. Available only in print and card form. "Let the sea in all its vastness roar with praise! . . . Let the waves clap their hands in glee, and the hills sing out their songs of joy before the Lord." Various papers, including original music manuscript, suggest the hills mentioned in this Psalm. The torn paper waves are lifted slightly off the surface, as can be seen by the cast shadows in the photograph. This collage comes in an 14"x11" shadowbox frame. "By the word of the Lord were the heavens made: and all the host of them by the breath of his mouth." This collage uses layers of various papers, and a great deal of hand sewing through the layers with metallic threads. "So teach us to number our days that we may apply our hearts unto wisdom." This 16"x20" acrylic on canvas collage also includes stamping, transfer, and bits of paper. The bulk of the numbers are arranged within an hour glass shape that is not clearly defined. This is my most recent collage, finished just before I began working on my web site.